Zeus loved countless women, and loved to disguise himself as different creatures to get close to the woman he wanted. This time he fell in love with Leda, the wife of King Tyndareus. He ravished Leda disguised as a swan. Some months later, she laid two eggs, one hatching Castor and Clytemnestra, the other hatching Pollux and Helen. Castor and Clytemnestra were mortals fathered by Tyndareus, but Pollux and Helen were immortal, because Zeus was their father. The two brothers Castor and Pollux were raised together, and they identical; no-one could tell them apart. Fond of adventure, they joined Jason's expedition aboard the Argo to the Black Sea in search of the Golden Fleece. The ship had to stop at the entrance to the King Amycus' realm. Amycus, a brutal man, never let visitors pass through his land without challenging them to a boxing match. He allowed no-one to decline, and nobody survived. The brothers were known for their athletic ability, so Pollux was the first Argonaut to step forward. As soon as the chance presented, he drove his fist into Amycus' temple, crushing the skull and killing the King. The story of Castor and Pollux ends sadly. Their final adventure took them to Arcadia with two cousins (ex-Argonauts) to raid cattle. When the spoils were divided, the cousins tricked the brothers, and took everything for themselves. Castor and Pollux gave chase. The brothers took a shortcut and waited for them. Unfortunately, a cousin discovered Castor first shot him. Pollux avenged his brother. The other cousin, however, struck Pollux with a rock, knocking him unconscious. He ran in to finish him off. Luckily, Zeus watched the ordeal and killed the cousin with a thunderbolt. When Pollux regained consciousness, he realized that he no longer have Castor with him. He wished to join his brother, so he begged Zeus to remove his immortality. Zeus granted his wish and placed the twins in the sky to remind us of brotherly love. Each map can be clicked on to produce a 909x1199 version of it. They sport red labels, which look good on screen, but which disappear when used with red flashlights. Each map, therefore has a second link to a map better suited for printing in a graphics program, and using in the field. While they are quite large, they are all about 50k, and so are easy to view at today's modem speeds. The first map is a wide area view of the constellation, suitable for naked eye browsing. The next views are binocular width, showing stars to mag. 10, deepsky objects to mag. 12.9, and labeling deepsky objects to magnitude 12. 80k JPEG NGC 2392 (Best 54, Caldwell 39, or the Eskimo Nebula) is a bright (mag. 8.6), small (47"x43"), round planetary nebula with a mag. 9 central star. Located 2.3° ESE of Wasat (Delta Geminorum), it rewards high power views very well. How many shells of gas can you see? 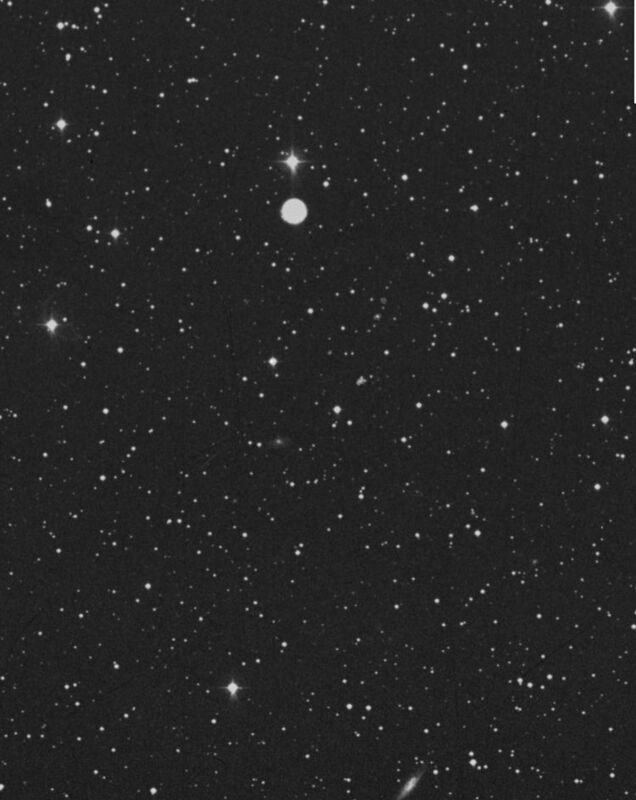 The photo from the Digital Sky Survey shows two "bright" stars. The one due north (up) is mag 7.7. The star to the northwest (top, right) is mag 8.6. The galaxy UGC3873 (mag 14.5) sits at the bottom edge of the picture. 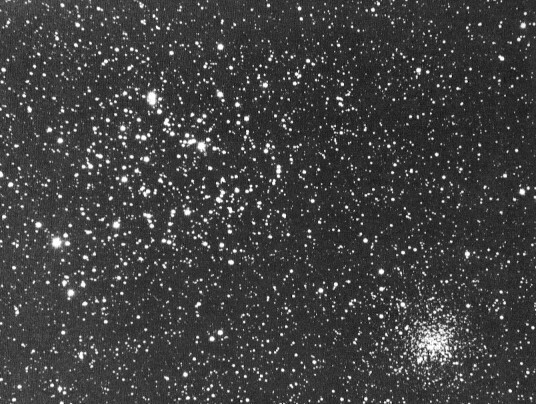 102k JPEG M35 (NGC2168) is open cluster located 2.3° NW of Propus (Eta Geminorum). Dreyer describes it as very large (28'), quite rich and condensed, with stars ranging from mags. 9-16. Overall brightness is mag. 5.1. This is a lovely open cluster, one of the best in the sky. The faint (mag. 8) cluster NGC2158 (Best 53) lies less than a degree WSW of M35. A low power eyepiece should include both, as this view does here. Photo from SEDS, which appears to have it from the Digital Sky Survey.